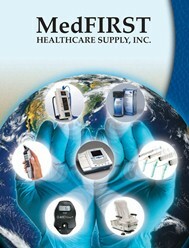 The world's first digital aneroid sphygmomanometer. The E-Sphyg replaces your mechanical gauge and its potentially fragile, vulnerable design, with a virtually indestructible, digital instrument that can stand up to the toughest use. Virtually indestructible design can withstand repeated drops of 5 feet or more. The E-sphyg gague is latex-free as the bumper surrounding the manometer is manufactured from Thermoplastic Polyester Elastomer (TPE). Extra large backlit LCD with 3/4" digits, is easy to read in virtually any light. Splash resistant housing for use in harsh environments. Swivel cuff clip allows the manometer to be re-positioned for easy viewing. Auto off function conserves battery strength. Recalibration reminder after 10,000 cycles (recalibration is free for the life of the instrument). Systolic assist alerts practitioner to the onset of Korotkoff sounds - makes a great training aid. Deflation rate display promotes proper technique in accordance with AHA guidelines. Pulse rate display at completion of measurement. Manometer works with virtually every cuff on the market. 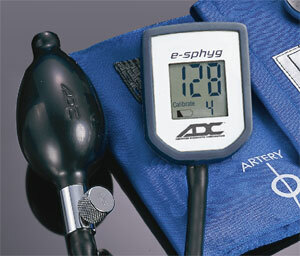 Requires familiar and trusted manual auscultation to obtain blood pressure readings (use of stethoscope). May be ordered as a complete sphygmomanometer featuring nylon Adcuff inflation system or gauge only for use with existing inflation systems.